Using a hand held mixer, beat the OREO Cookie crumbs and cream cheese together until well combined. Roll the mixture into balls. Chill the balls, covered tightly, for an hour in the fridge OR freeze for 20 minutes. Once the balls are chilled, melt the candy melts according to package directions. You may need a teaspoon (or a few) of vegetable oil to get the chocolate thin enough to dip in. Every chocolate is a little different so if needed, I'll just add the oil slowly until it coats the truffles well. Holding a small handful of sprinkles, sprinkle them gently over the truffle. 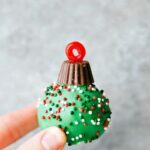 Press a miniature peanut butter candy cup into the top of the truffle. Pull apart the licorice and then cut into a small piece. Fold into a small circle and dip in some of the melted chocolate. Press and hold on top of the peanut butter cup until secured. Allow to dry at room temperature. Store leftovers in an airtight container in the fridge.